A new study looking at their impact on workers’ future finances concludes that divorce – the fate of four in 10 marriages – “substantially increases the likelihood” that their standard of living will decline after they retire. Half of all U.S. households are already at risk of a lower living standard when they retire. The researchers – Alicia H. Munnell, Wenliang Hou and Geoffrey Sanzenbacher of the Center for Retirement Research – recalculated this risk just for the households that had previously been through a divorce. The analysis was based on their projections of how much retirement income the households can expect to receive at age 65 from Social Security, pensions, retirement savings, and home equity. The researchers controlled for other factors that also affect retirement finances, such as age and education. They found that the share at risk of a lower retirement living standard is 7 percentage points higher for all households with a history of divorce than it is for similar households with no prior divorce. To put this into context, the Great Recession increased retirement risk by 9 percentage points. Most of the subgroups analyzed also are facing the prospect of more risk, which rises sharply for married couples with at least one previously divorced spouse and for divorced men who have not remarried. The exception is divorced women who didn’t remarry. They were unaffected, even though they often assume the responsibility – and added costs – of being the children’s primary caregiver. The researchers suggest that these costs may be offset, however, because divorced women often retain ownership of the family home in the divorce settlement – and home equity is a retirement resource. 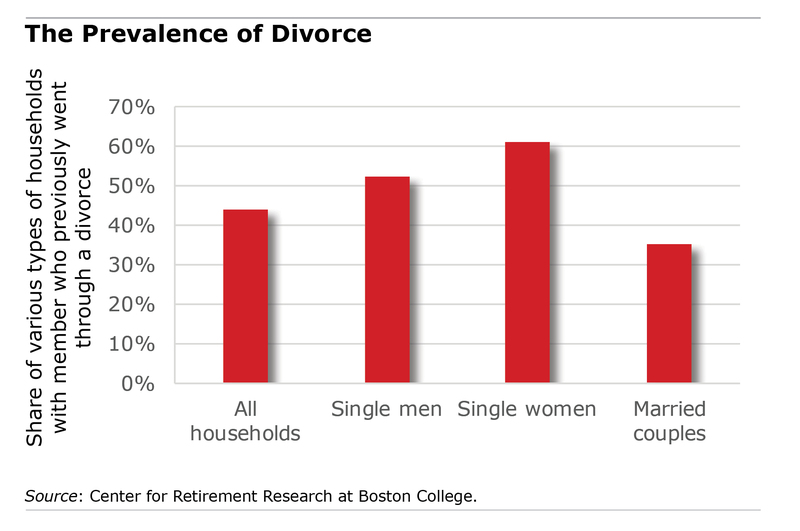 But for most people who divorce, their retirement finances will take a hit. The good news is that divorce rates, having peaked with the baby boom generation, are now in decline. This is very interesting and important. However, as a single father who raised his children alone from very young ages, it would be nice if you got in sync with modern times and didn’t use language like this “hamper the ability of the primary caregiver – mothers.” Fathers are much more often caregivers than you evidently think. Joe – I apologize for such a dated viewpoint. I definitely should’ve acknowledged that this is an issue for many fathers, too. And hats off to you for being your children’s primary caregiver! I doff my hat to Kim for the reply! One option to alleviate the sale of the home and liquidating the portfolio is using a two HECM aka reverse mortgage strategy. The strategy allows one spouse to stay in the existing home and buy out the other. The other spouse uses the buy out money to purchase a new home with a HECM. I’d be happy to explain. Love is grand. Divorce is thirty grand.